“Why should we not achieve with movie cameras what we did with inexpensive snapshot still cameras?” In 1932, businessman Otto W. Githens and taxicab insurer Jacob J. Shapiro established the Universal Camera Corporation of New York, U.S.A. Within 12 months, they had supplied millions of Americans with still cameras and then asked themselves whether it was possible to repeat this success with moving image technology. 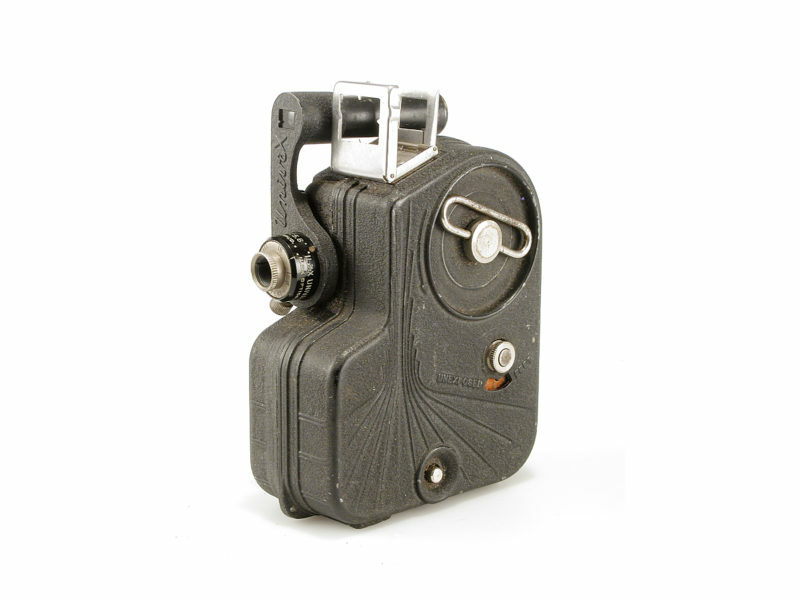 They introduced their first cine camera, the “Univex Model A-8,” in September 1936; it was designed by 27-year-old George Kende. Into the body made from die-cast zinc went the reasonably priced, 8mm wide film called “Straight-8“ or “Single-8.” The film came on a reel, was 30 feet (10 meters) in length, had 2,400 individual frames and lasted for about two minutes. One couldn’t beat the cost of one camera at $9.95, and by 1937, about 250,000 had already been sold. After the introduction of the models “B-8” and “C-8” in 1940, the company encountered difficulties with the supply of film stock, which was produced by Gevaert in Belgium. The war in Europe was raging at full scale. In the summer of 1941, and now deep in the red, Universal introduced a new movie camera series with interchangeable lenses, which could accommodate both the Univex Single-8 film stock and Double-8 reels. Before the war, only 2,000 “D-8,” 3,000 “E-8” and 10,000 “F-8” cameras had been fabricated. Starting in September 1946, a promising total of 65,000 units of the “Univex Cinemaster II” were being sold. But by January 1951, with the introduction of the “Cinemaster H-8,” which could take only Double-8 reels, the post-war market presence was finished. In March 1952, the Universal Corporation, mainly known for its snapshot still cameras “Mercury,” “Minute-16” and “Corsair,” went bankrupt.